..he can write music that sounds like that of no one else. 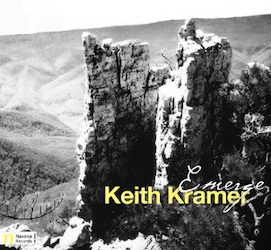 Emerge is an exciting and absorbing journey into the mind of a master artist. TOP PICK. After Keith Kramer's two groundbreaking releases on the Navona label, Emerge and Causal Dualism, the film Beyond Sonic Boundaries Live! 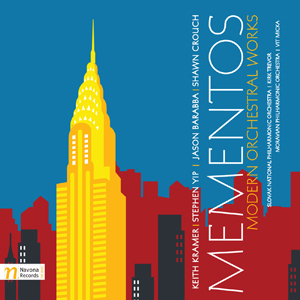 2010 chronicles a New York performance of the composer's most innovative works, featuring riveting and powerful performances by some of today's best musicians, including David LaVorgna, flute, Jessica Hanel Satava, soprano, Joseph Satava, piano, Gottfried Stoger, soprano saxophone, Sebastian Stoger-DeMayo, violoncello, David Taylor, bass trombone and the Azimuth String Quartet. Bonus features on this DVD include a performance by the harp and saxophone duo Pictures on Silence, as well as complete biographies and exclusive behind the scenes rehearsal photos. 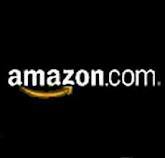 The DVD is now available at Amazon and CD Baby! Please click below to order this exciting new release. 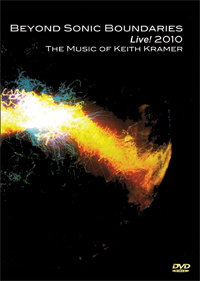 Keith's orchestral work Emerge, performed by the Slovak National Symphony Orchestra, led by Kirk Trevor, can also be found on the Navona release Mementos, which also includes the orchestral works Raining In Autumn by Stephen Yip, Conjecture by Jason Barabba and City Columns by Shawn Crouch. This release is available through the Navona Records website, Amazon.com and iTunes. 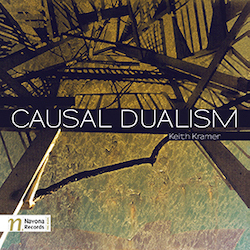 Causal Dualism, an exciting CD of Keith's work, includes Duality (scored for soprano saxophone, bass trombone and string quartet), and Causality (scored for string orchestra, piano and percussion). 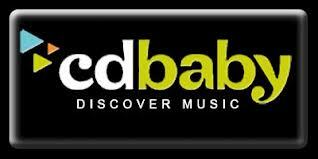 It is aurally and visually an awesome release and is highly recommended. The disc features the Moravian Philharmonic Orchestra conducted by Vit Micka, bass trombonist David Taylor, soprano saxophonist Gottfried Stoger and Jade Strings, featuring violinists Lisa Lee and Wei Tan, violist Ching Chen Juhl and violoncellist Clara Lee. Causal Dualism is a Navona release. Repeated rhythmical patterns also play a part, weaving outwardly different material together and sometimes disappearing all together, leaving pieces hanging in a suspended state for a while, until the groove kicks back in. And then, of course, there is the inclusion of sudden outbursts of tremendous vitality in a Jazz idiom, a stream of consciousness pouring forth from the fabric of the pieces like a sudden streak of genius. Kramer has not made things easy for himself. To make these different aspects come together without them sounding comical must have represented some hardships and so must the task of making them come alive in an emotional way. The thought that he must have both loved and hated the implications of this decision is nicely dualistic, but I doubt it will have helped him much in accomplishing this rich and rewarding work. - Tobias Fischer from http://www.tokafi.com/ (read the whole review from www.tokafi.com here).